Most people know Jody as the creator of the "Conan™" swords -- he sculpted and assembled the blade and hilt for the "Master's (Father's) Sword™." He created the blade for and assembled the "Atlantean™" sword. Both have become icons in the Conan™ legend, inspiration to swordsmiths everywhere, and symbols to many of the epitome of swords and sword making. This is an outstanding investment, as Jody's pieces continue to appreciate in value, year after year. This is a one-of-a-kind- completely custom piece. There is not, and never will be another like it. 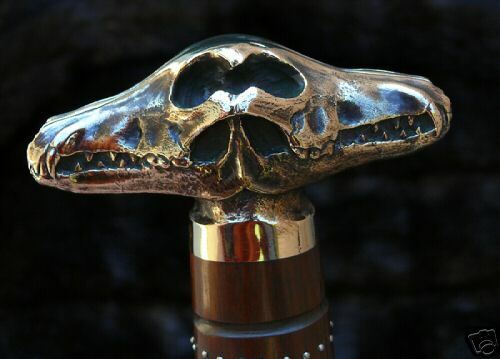 The double wolf skull pommel is the only one of its kind. An arctic wolf skull was used as the reference model. The blade is deeply hollow ground of 1/4" 6150 steel. 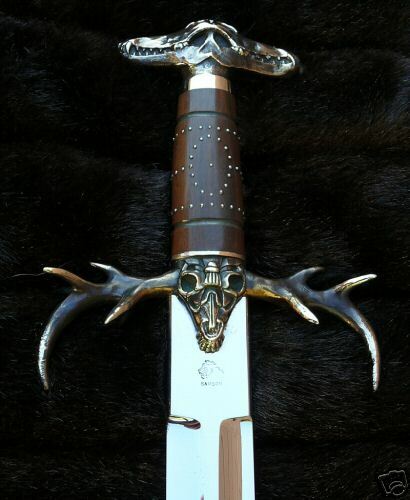 The guard and pommel are "lost wax" castings of a stag skull and antlers from one-of-a-kind original waxes hand-carved by Jody, and the blade is struck with his makers mark. The brass castings have been antiqued. The handle is rich polished cocobolo hardwood with sterling silver escutcheon pin accenting. There is no chrome on the blade, it is simply so highly polished that it seems to glow from within. The edges are unsharpened, but will hold a lethal, hair-shaving edge. Piece has been kept glass cased and lightly museum waxed since its commission nearly a decade ago. This is a heart-stopping piece, crafted by one of the true master of the craft, destined to be the centerpiece of any serious collection. The sword balances and handles magnificently and is very fast in the hand. My loss is your gain! Posted: Thu 09 Aug, 2007 2:27 pm Post subject: Somehow forgot to include asking price! Asking $1,850.00 Financial crisis forces price this low.